T P M S M T D O c t o b e r 2 0 1 8 80 When the tire pressure warning message has been displayed and the warning light comes on, immediately check the air pres- sure of all tires and adjust to the specied pressure listed on tire label. In certain cases, it may be necessary to drive the vehicle for 10 minutes or more at least 25 mph (40 km/h). -is will erase the warning text and the warning light will go out. TIRE PRESSURE MONITOR RESET NOTE: When installing TPMS sensors, the vehicle must be parked for at least 15 minutes with the ignition oŠ. If the vehicle is driven before 15 minutes has elapsed, a TPMS error message will be displayed. NOTE: A low frequency initiator (sen- sor activation tool) can be used instead of driving. NOTE: A low frequency initiator does not work with the sensors on 2007 and later S80 models. Except Canadian models A'er replacing tire pressure sensors, the control module does not need program- ming. -e control module automatically contacts the sensor itself a'er driving the vehicle at least 25 mph (40 km/h) for 10 minutes or more. -e TPMS indicator light will go out when all sensor IDs are learned. Canadian models 1) With ignition ON and engine OFF, press the MY CAR key in the center console control panel and select SETTINGS > CAR SETTINGS > TIRE PRESSURE. 2) Press OK/MENU, select CALIBRATE TIRE PRESSURE and press OK/MENU again. NOTE: Calibration is done automati- cally once initiated by the driver and the system does not give any conrmation when calibration is nished. 3) Drive the vehicle at a speed above 25 mph (40 km/h) continuously for at least 10 minutes. DEMOUNTING/MOUNTING PROCEDURES CAUTION: -e tire should be demounted from the wheel using the tire changer manufacturer's instructions. Use the fol- lowing information to avoid damage during the demounting/mounting procedures. 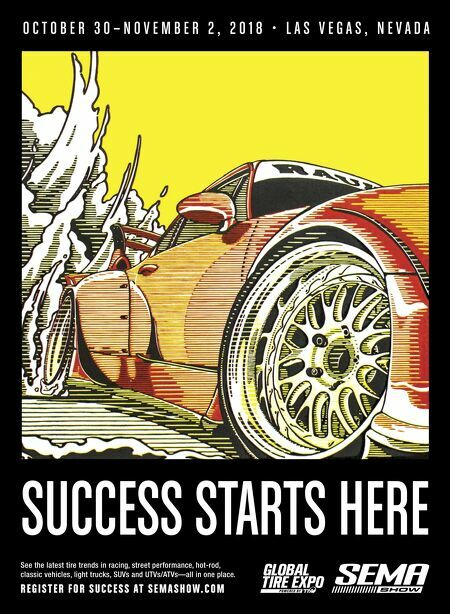 CAUTION: Only factory-mounted wheels are equipped with TPMS sensors in the valves. If the vehicle is equipped with a temporary spare tire, this tire does not have a TPMS sensor. CAUTION: When in¢ating tires with TPMS valves, press the pump's mouthpiece straight onto the valve to help avoid bending or otherwise damaging the valve. 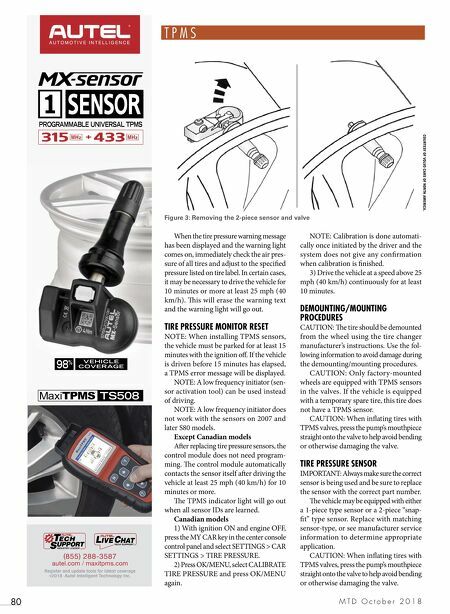 TIRE PRESSURE SENSOR IMPORTANT: Always make sure the correct sensor is being used and be sure to replace the sensor with the correct part number. -e vehicle may be equipped with either a 1-piece type sensor or a 2-piece "snap- t" type sensor. Replace with matching sensor-type, or see manufacturer service information to determine appropriate application. CAUTION: When in¢ating tires with TPMS valves, press the pump's mouthpiece straight onto the valve to help avoid bending or otherwise damaging the valve. A U T O M O T I V E I N T E L L I G E N C E ( 855 ) 288-3587 autel.com / maxitpms.com Register and update tools for latest coverage © 2018 Autel Intelligent Technology Inc. TS508 98 % VEHICLE COVERAGE PROGRAMMABLE UNIVERSAL TPMS Figure 3: Removing the 2-piece sensor and valve COURTESY OF VOLVO CARS OF NORTH AMERICA.